If you use Text to Speech feature of Ozeki Phone System XE, it is possible to install and use different languages. In this guide you can see how to download different languages from Microsoft and how to install and setup them in your OzML script. The following table shows the languages are supported by Ozeki Phone System XE. All these languages can be used for text to speech. 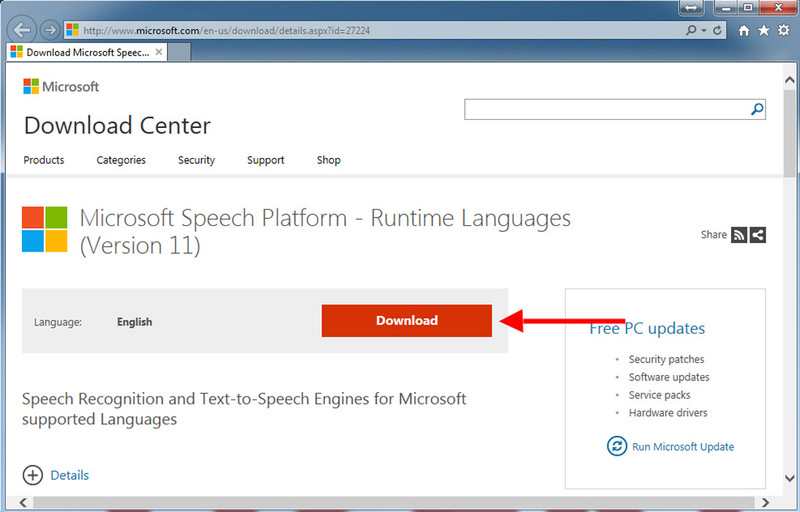 Figure 2 shows where you need to click in order to download Microsoft Speech Platform - Runtime Languages (Version 11). After clicking on the Download button, the next page shows the available languages you can use for Text to speech feature of Ozeki Phone System XE. Here you need to select the languages you want to use. 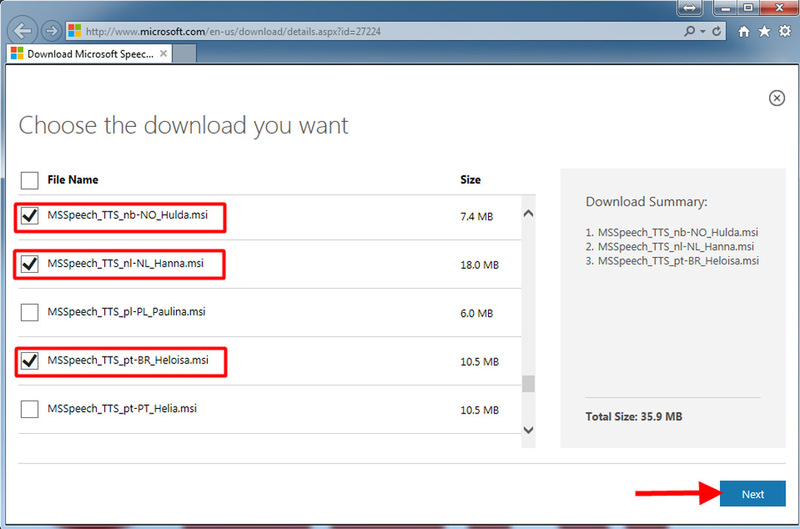 Then click on Next button to continue downloading the file (Figure 3). On the next page you can make a decision about saving the languages or running them immediately after downloading (Figure 4). 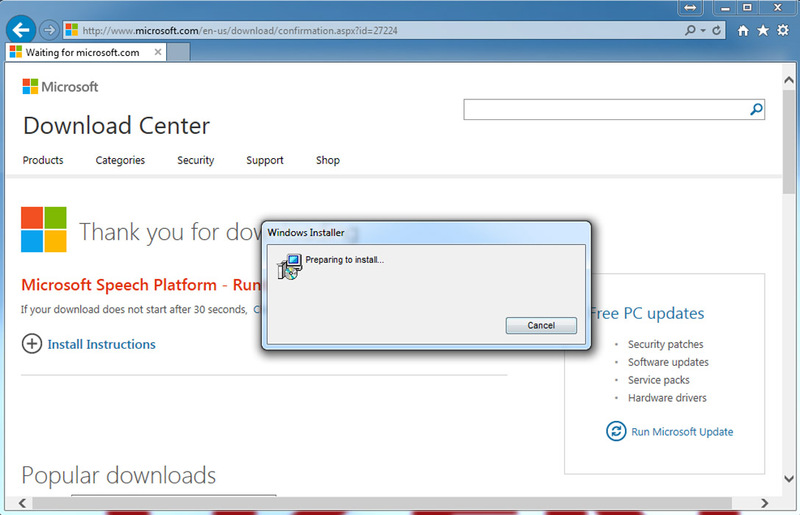 After you have downloaded the selected languages, run the installer and wait for the end of the installation (Figure 5). 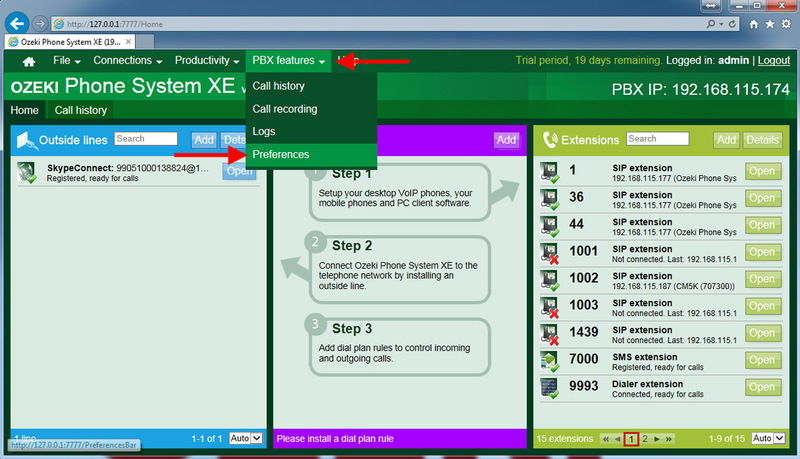 After you have installed the language pack, restart the service of Ozeki Phone System XE. Now, your system is ready to use different languages in your Ozeki Phone System XE. The following two steps give instrustions about how to setup your PBX to use the installed languages or choose a language in your OzML script. In this step you can see how to select the language you want to use in your Ozeki Phone System XE. 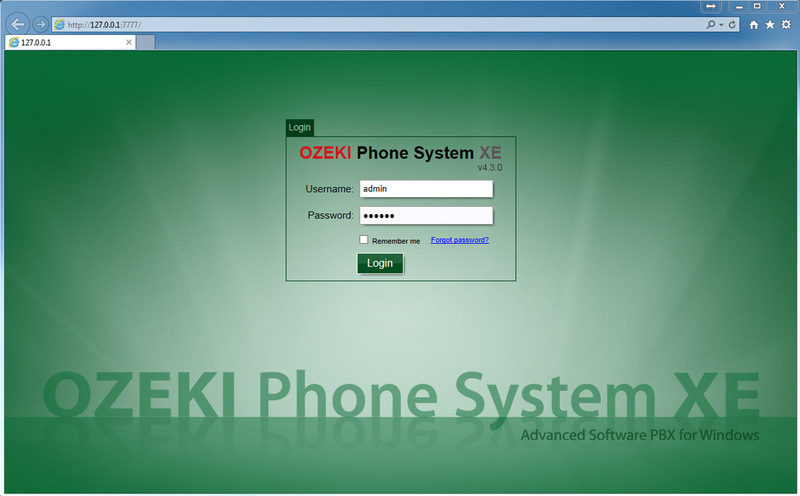 First open a web browser and login to your Ozeki Phone System XE (Figure 6). 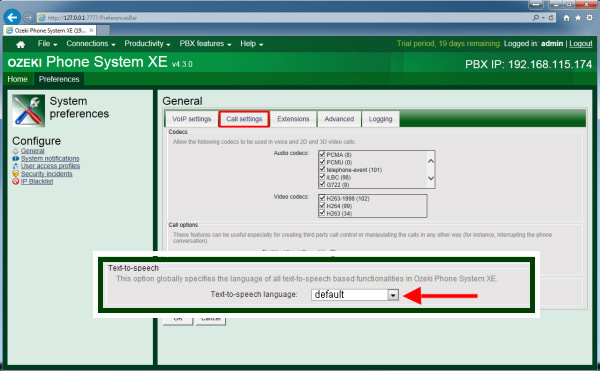 On the main screen find the PBX Features menu and select Preferences (Figure 7). Then, under the Call settings tab in the Text-to-speech section select an installed language you would like to use. After you have selected your language, click on Ok button (Figure 8). If you have an OzML script that uses <Speak> command, it is also possible to configure the Text to speech language in your script. The <Speak> command has a Language parameter that allows you to choose from different languages in which the text will be read out by the Text to speech engine. The following example code (Code 1) shows how to use it. 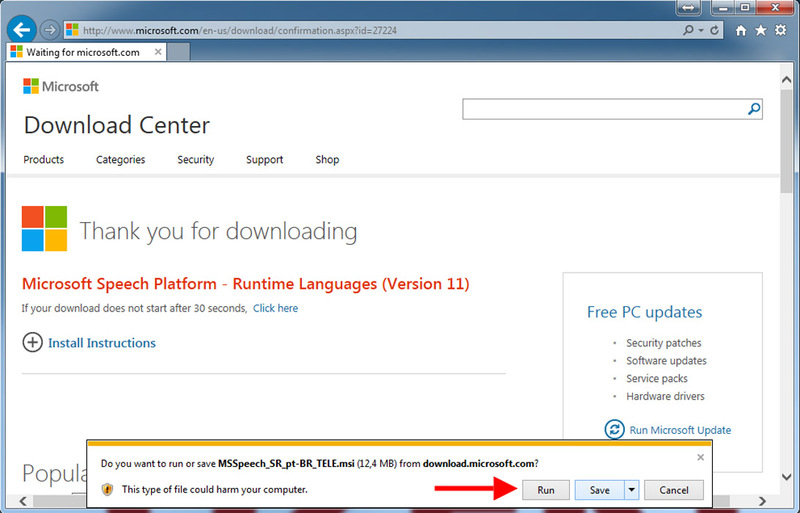 In the Language parameter you need to use the short code format of the languages that can be found on the Microsoft webpage where you can download them. If a language has more voices, you can specify which one to be used. This can be set by using the Voice parameter of the Speak command. This can also be seen in the second Speak command in the following code. Hello, this text will be read out in English language. Olá, este texto será lido em Português.